AU COEUR DE LA CITÉ – La Brasserie du Donjon offre un décor de caractère qui mélange l'époque médiévale pour l'atmosphère et le contemporain pour le confort. La cuisine, quant à elle, est naturellement orientée Sud-Sud-Ouest. Qui s’en étonnerait ? CUISINE DU TERROIR – Délectez-vous à la simple lecture d’une carte inspirée et diversifiée proposant des spécialités méditerranéennes et quelques grands classiques du Sud-Ouest. Le menu du Pays Cathare constitue un classique incontournable pour s’imprégner de la culture gastronomique locale. UNE ADRESSE DE CHOIX – Ouverte toute l'année, pour le déjeuner ainsi que pour le dîner, la Brasserie est cependant fermée le dimanche soir, de novembre à mars. En été, une grande terrasse s’ouvre à vous. Excellent New Year dinner, delicious menu and attentive service in a calm unhurried informal atmosphere. We will return. Nothing wrong with the food, service felt rushed and there was little time to savour the food or atmosphere, the restaurant appears to cater for crowds and wants people in an out quickly. The restaurant terrace where we ate is really lovely,with nice shade and the old cut stone walls.Lovely ambience and friendly staff.Service was prompt,prices very fair and good food. 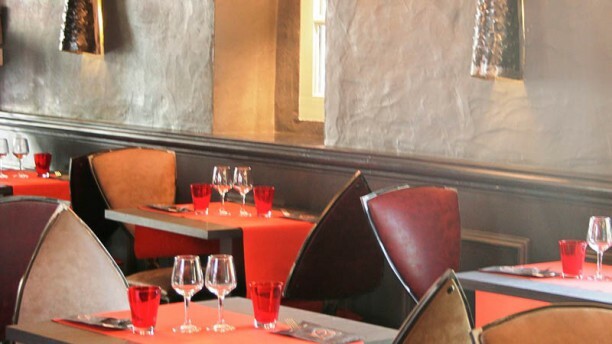 This is a nice place to eat in the cité de Carcassonne. The place is nice indoors and outdoors well désigne for groups. The service was fast and effective. They have young waiters able to speak emmglish. It is a place where I will go back. My partner’s French onion soup had burnt cheese on the top, one of the bread rolls was hard and inedible, then the chips were burnt, and his steak was overcooked. I tried to tell the waiters, but they were not interested. When they brought rolls for my dessert of cheese, they were burnt too! Very unsatisfactory. No care taken. We were welcomed by a free glass of champagne as soon as we were seated. Both of us had cassoulet and it was excellent. The wine list was good and contained a number of local varieties in the 59cl size. We thought that the price was quite reasonable for a restaurant of this quality in such a popular location within the old city. Nice welcome with complementary olives and 2 small glasses of Kurds - then pretty much downhill thereafter. Starters: goats cheese and aubergine millefeuille was good, onion soup was very poor (full of soggy lumps of bread, tasteless). Mains: entrecôte steaks were pool quality, lots of gristle, tasteless. Good value given the setting of inside the City Walls of the Castle. The childs menu was limited with only three choices and everything served with chips. That said, that appeared the norm for most other restaurants classed as "child friendly". Huge portions of mediocre, disappointing food. Fried potatoes were soggy and limp. Cassoulet was a watery bean soup with tasteless sausage. Service was absolute minimal. Location and ambiance were agreeable and the only good part of the experience. We were very well received, with an aperitif (thanks to the booking via lafourchette). Execellent service, despite being very busy. Food very good, just short of excellent, wine very good indeed. Recommended. The only problem was that they could not accept any credit card and suggested we go to an automatic teller. Finally I suggested they charge the bill to our room at their hotel.